The artist's family, and thence by descent to the present owner. K. Pfister, Münchner Neuste Nachrichten, 12 May 1919, p. 2. 'Heinrich Maria Davringhausen. Zur Ausstellung bei Hans Goltz', in Der Weg, I, no. 4, 1919, p. 8. J. Heusinger von Waldegg, H.M. Davringhausen 1894 - 1970. Monographie mit Werkkatalog, Bonn 1977, no. 47 (illustrated). A.C. Oellers, Ikonographische Untersuchungen zur Bildnismalerei der Neuen Sachlichkeit, Bonn, 1983, p. 501 (illustrated). T.W. Gaehtgens, 'Faszination und Verführung. Berlin als Provokation für die Kunst. "Ich und die Stadt" im Martin-Gropius-Bau', in Weltspiegel, 16 August 1987, p. 1 (illustrated). Exh. cat. Süddeutsche Freiheit - Kunst der Revolution in München 1919, Galerie im Lenbachhaus, Munich, 1993 (illustrated p. 53). D. Eimert, Heinrich Maria Davringhausen. Monographie und Werkverzeichnis, Cologne, 1995, no. 101 (illustrated p. 123). Munich, Galerie Neue Kunst Hans Goltz, Heinrich Maria Davringhausen, April 1919, no. 16. Düsseldorf, Städtische Kunsthalle, Das junge Rheinland, 1919, no. 47. Cologne, Galerie am Rhein, Heinrich Maria Davringhausen. Frühe Bilder. Gedächtnisausstellung 1894-1970, February - March 1971. Bonn, Rheinisches Landesmuseum, Heinrich Maria Davringhausen: Der General - Aspekte eines Bildes, 1975, no. 16 (illustrated p. 19). Berlin, Berlinische Galerie, Martin-Gropius Bau, Ich und die Stadt, August - November 1987, no. 26, p. 236 (illustrated p. 123, pl. 19). Heinrich Maria Davringhausen's Der Dichter Däubler (The poet Däubler) is one of the artist's earliest and most important paintings. A large, vibrant and radically innovative 'psychological portrait' of an Expressionist poet and his ecstatic vision, it is a work that marks a turning point in German Expressionism. Like Davringhausen's life-size full-length portrait of a madman, Der Irre painted a month or so previously, Der Dichter Däubler is in its own way a protest against the insanity of the First World War and among the very first examples of the Magic Realist style of painting that would later inform and develop the Neue Sachlichkeit of the 1920s. 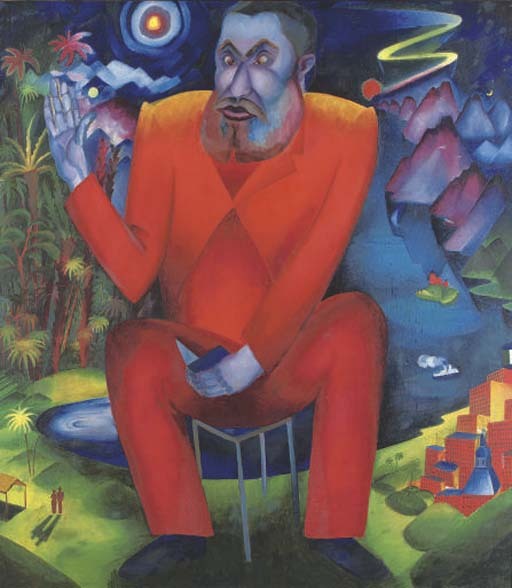 Painted in January 1917, at the height of the First World War, Der Dichter Däubler depicts the Expressionist poet Theodor Däubler reciting his fantastical poems amidst the appropriate backdrop of an equally fantastical and exotic tropical landscape. Theodor Däubler (1876-1934) was, by all accounts, an imposing and unforgettable figure on the European literary scene at this time. A maverick Mediterranean figure of Austro-Hungarian origin, Däubler led a near nomadic existence travelling regularly and widely throughout Europe and the Middle East. Best known for his three-volume epic poem of cosmology and mystic symbolism, Das Nordlicht (The Northern lights), first published in 1910, Däubler spent most of the years 1910-19 in Berlin, where he became an influential art critic and a stalwart on the Expressionist scene. In Berlin, he became a leading figure of the circle that frequented the Café des Westens and included the poets Else Lasker-Schüler, Gottfried Benn and Johannes R. Becher, as well as the apocalyptic painter Ludwig Meidner. A great admirer of Robert Delaunay and the Italian Futurists, Däubler became an important champion for many of the younger generation of Berlin artists who joined this circle during the war years. Foremost among these were Davringhausen, Wieland and Helmut Herzfelde (John Heartfield) and George Grosz. Grosz, who remained a close friend of both Davringhausen and Däubler throughout his life, fondly remembered this outsize Expressionist poet, 'nicknamed Fat Theodor' in his autobiography. In addition to recalling the many wild ('Saufereien') nights spent in the company of Davringhausen and the 'good, brave and always hurried Theo', he remembered Däubler as a 'Mediterranean type (with) a beard and a big belly (who) ate and smoked enormous quantities... It was a treat to listen to him. He enjoyed being surrounded by young people, poets and painters; he was at the centre of a small circle and when he lay on the couch with tight top button of his pants open, he could really have been a Greek philosopher surrounded by his students. His facial similarity to Zeus would indicate a wise, controlled lifestyle. Nothing could have been further from the truth. He was constantly rushed and short of money despite a comfortable retainer from Insel publications. The trouble was that money would not stay with him, it ran away, often into murky channels... He enjoyed reading to us from his Nordlicht epic, a cosmological giant work full of secret symbolism and prophecies that only the initiated could comprehend. The only trouble was that he got carried away (as easily happens to poets) and never stopped. When his friend Else Lasker-Schüler, was there, we heard her relaxed snoring, notwithstanding the booming voice of the Nordlicht poet. That did not bother Däubler, he said that was simply subconscious jealousy' (quoted in G. Grosz, A Little Yes and a Big No, New York, 1946, translated by Nora Hodges, pp. 102-3). In this equally fond portrait of his friend Däubler, Davringhausen presents the poet as a grandiose and epic figure somehow larger than life itself. Here in this large-scale, vibrant and imposing portrait - as broad, colourful and intense as the man himself - Davringhausen presents this great 'unshaven Buddha' as Lothar Schreyer once described the poet as a cosmic entity. Depicting the legend as much as the man, this is a portrait of the mystical 'prophet' of Das Nordlicht and the champion of Der neue Standpunkt (the New Viewpoint), Däubler's 1916 book on the current revolution in art, as an Expressionist phenomenon. Captured in full flow at one of his poetry readings and mystically transforming the space around him into an entire cosmic landscape of his own mind, Davringhausen's Däubler is a neo-primitive and colossus who bestrides a fantastical and exotic world of romance and adventure. Like the fantasy landscapes of America that Grosz gave expression to in his paintings of the Wild West (1916) and Die Abenteurer (The Adventurer, 1917), the vast world that Davringhausen articulates here also seems an extension of the personality of the central figure, part psychological landscape, part escapist fantasy. As in Däubler's own poetry the sky is filled with cosmic portents. Sun, moon, comets and stars radiate in what the daughter of Davringhausen's gallerist, Charlotte Goltz, once described as a moonlit 'blue aura' that dominates so many of Davringhausen's finest paintings of this period. Below it, mountains, oceans and tropical islands merge into a harmonious unity. At the bottom right of the painting rests a coastal city which with its prominent Italian flag is probably intended to indicate Däubler's native Mediterranean city of Trieste. Däubler himself is shown as a god-like figure communing with the elements. A primitive or Old Testament style prophet, his almost crossed eyeballs seemingly lost in a mystical trance, their spheres apparently echoing those of the sun, moon and planets whirling around him as if to reiterate the poet's concept that 'the centre of the world is in every "I"' (quoted in T. Däubler, 'Expressionism', in Der neue Standpunkt, 1916, Dresden, 1916, pp. 179). The style that Davringhausen uses to render this Expressionist colossus is deliberately simplistic, childlike and primitive. It is part of a consciously infantile manner of expression that Davringhausen developed during the war years as a pictorial echo of the values of much literary Expressionism and a revolt against the faux sophistication of an Imperial Germany that was slowly and inexorably heading towards self-destruction. Spontaneity, passion, primitivism, childishness and raw directness of expression were the values that Expressionists such as Däubler and Davringhausen valued above all others. As in the work of so-called primitives such as Rousseau, Chagall and Klee who were all admired by the artists and writers in this circle, naivety of formal expression was worn proudly as a rebellious badge of passion and intellectual sincerity. While Grosz sought a rebellious and angry expression in the crude forms of graffiti and children's art, Davringhausen developed the simultaneity of Grosz's Futurist-inspired technique into a more 'sachlich' Magic Realist style that mixed multiple realities into a single image. In works like Der Irre, Der Träumer II and Der Dichter Däubler, this is an approach wholly appropriate to the psychological subject matter of each picture. Däubler, who was once described in Der Sturm as being a life-force whose inner-light was so great that it overcame the powers of nature, was the quintessential Expressionist, a man who lived and dreamed according to the dictates of the inner world of his psyche. Along with Else Lasker-Schüler, Grosz and others, Davringhausen was a part of an inner circle of friends who shared in this intimate inner world of dreams and cosmic fantasy that Däubler propagated. The concept of multiple and conflicting imagery and of a borderless division between dream, fantasy and reality, was innate to these poets and artists, trapped as they were in an oppressive and functionary world of rigid values and fixed order. As early as 1914 Lasker-Schüler had adopted an exotic male alter-ego for herself, Prince Jussuf of Thebes, who lived in a fantasy orient. In this fantasy world of her imagination, Grosz was Leatherstocking - an American adventurer named after Fennimore Cooper's stories and the artist's own escapist fantasies of America. Davringhausen, on the other hand, she described as a 'young Trojan priest travelling on a wooden craft as old as a tomb'. Almost always, these imaginary characters and the many other alter-egos and identities under which these and other artists of the period posed at this time were personae of either exile or escape. Part of an ecstatic vision personified by poets like Däubler, they were wish-fulfilling fantasies of a brighter and better world, away from the stark daily reality of an outmoded and autocratic Prussian nation that was sucking the life out of itself in a disastrous and interminable war. Seen in this context, Davringhausen's Magic Realist portrait of Däubler stands like a religious icon - an apotheosis of the Expressionist dream. Anticipating much of the cosmology and optimism that two years later would distinguish the utopian Expressionism of the revolutionary period in Berlin at the end of the war, Der Dichter Däubler is a proud, naïve and ultimately rebellious vision - a statement of faith in the glory and triumph of the human spirit.